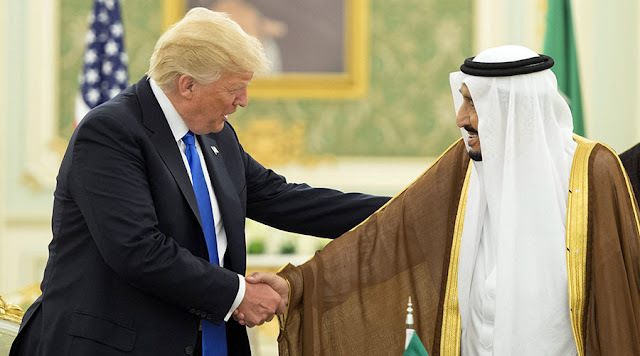 Remember President Trump’s big, triumphant arms deal in Saudi Arabia? It turns out it didn’t really happen. It was Trump’s own fake news, a feat of supply chain vertical integration and more importantly for the MAGA agenda repatriating jobs from Russia. In all seriousness, at the end of the day it didn’t happen. There are no contracts or sales. At all. So how could this be? The story comes from Bruce Riedel, a longtime CIA and national security official, now at Brookings. The Potemkin deal turns out to be remarkably similar to the Trump jobs announcements we’ve grown accustomed to. Trump takes a bunch of jobs or investments which either already exist or have already been announced and rebrands them as new economic growth driven by Trump Power. In this he usually has a compliant and complicit CEO, happy to go along with the charade to curry favor with the US President. As I said, this turns out to be remarkably similar. The $110 price tag advertised by the Trump White House includes no actual contracts, no actual sales. Instead it is made up of a bundle of letters of intent, statements of interest and agreements to think about it. In other words, rather than a contract, it’s more like a wishlist: an itemized list of things the Saudis might be interested in if the price of oil ever recovers, if they start more wars and things the US would like to sell the Saudis. As I said, it’s remarkably like the Trump-branded phony job announcements: earlier plans, themselves not committed to, rebranded as new decisions, with the Saudis happy to go along with the charade to curry favor with the President who loves whoever showers praise on him. Let’s note for the record that the underlying reality here isn’t necessarily bad news. It’s quite debatable whether we should be selling massive amounts of new arms to Saudi Arabia. But we should know whether or not it happened. What actually strikes me about this is not so much the Trump Team’s deception. That’s really expected at this point. What’s remarkable is that we’re only finding out about this, not from a news organization or reporter, but from a national security hand who did his own poking around. This isn’t a secret conversation or classified project. When you make a deal with a price tag over $100 billion it creates a trail. Why didn’t reporters on the national security beat figure this out?